For anyone who is looking for stand-up comedy resources, there is one book that I consider a must read — especially for new comedians — that doesn’t fall into that category. The name of the book is Comic Lives by Betsy Borns. While the book is a bit dated (originally published in 1987), you simply won’t find a better resource for discovering what the world of stand-up comedy is really all about. There’s much more to know about stand-up comedy than merely trying to write jokes and “getting discovered” the way most people think that it happens. 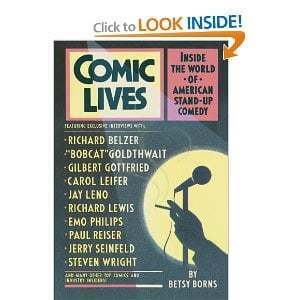 Comic Lives gives the reader a detailed and candid view of stand-up comedy from the comedian’s perspective and provides insight on the challenges every comic faces in carving out a stand-up comedy career. The book details beginning comics though starts from having no place to practice their art to striking clubs who reaped a bonanza when the clubs took off who still were not paying the performer. If you’ve ever been wondering what it’s like to be a stand-up comedian, their lives or the history of stand-up from its beginnings at the IMPROV, then this is the definitive guide. This is one of the best and most complete books I’ve read on the subject. A must read for anyone considering entering the field of stand-up. It’ll answer those questions you’d love to ask the ‘name’ comedians if you could get an hour of their time. One of my favorite stories in the book was about comedian Paul Rodriguez, who was in the lower third of comedians at the Comedy Store in LA at the time (which means he wasn’t yet close to being funny). But he got recognized and picked for a short lived TV show called AKA Pablo that only lasted for 6 episodes. For the next two years Paul Rodriquez had to turn down stand-up comedy performing offers as a result of the show because he didn’t have the amount of quality stand-up comedy material to accept those gigs. This is just one small example of the type of insight that’s available in Comic Lives. The book features fantastic and revealing interviews with comedians such as Jay Leno, Steven Wright, Richard Belzer, Paul Reiser, Jerry Seinfeld and many more. Like I said, Comic Lives is not a stand-up comedy how to resource per se, but I certainly consider it a must read for anyone who is serious about jumping into stand-up comedy. Are You Funny Enough To Be A Comedian? This entry was posted in Stand-up Comedy Tips and tagged betsy borns, comedy career, comic lives, gigs, improv, jokes, paul rodriguez, stand up comedian, stand up comedy, stand-up comedy how to by Steve Roye. Bookmark the permalink. I’m going to get this book. It sounds great. Another great book for comedians is ”Naked Jape” by Jimmy Carr.